Strange Tales #180 marvel 1975 CGC 7.5 SS comic! 1ST GAMORA! SIGNED BY STARLIN!! knicks_3000 has no other items for sale. THE POWER OF WARLOCK #14 (1976) MARVEL COMICS STAR THIEF! SOUL GEM! JIM STARLIN! Strange Tales #178 VF- 7.5 Warlock & 1st Magus 1975 Key Issue Jim Starlin Art! Warlock 1-15 Lot. 1 2 3 4 5 6 7 8 9 10 11 12 13 14 15. The Power of Warlock. The Strange Tales #180 issue by Marvel, published on June 10, 1975, includes 36 printed pages. It is available in English. This comic narrates the story of the main characters Adam Warlock and Kray-Tor. In this issue, titled “The Judgment,” Warlock decides to destroy the Soul Gem and when he does so, he is seen collapsing. At that very moment, Warlock realizes that he cannot live without the Gem as it has become his life force in the last three years. EBay is still one of the best places to find occasional great deals on early collectibles. 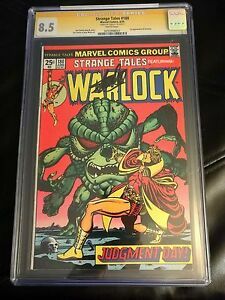 Found this early Warlock comic book showcasing the 1st appearance of Gamora from the Avengers Infinity War movie signed and graded by the original creator Jim Starlin CGC 9.4 for a very good price. This will be a great additional to my collection! So happy to have this key book in my collection!